A Science exhibition “VIO-SCIENCE EXPO 2018” on 5th January 2018 at 10.30 a.m., in the college premises. The Expo was inaugurated by the Chief guest Mr.G.Ulaganathan, Head-Department of Computer Science, Alpha Arts & Science College, Chennai in the presence of College Principal Dr. Kamala BalaKrishnan and Vice Principal Mrs. Japhia Solomon. 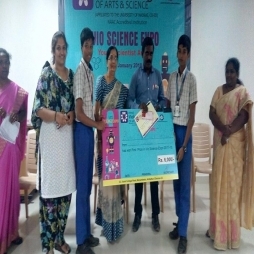 Students from various Schools participated in the event and the title “YOUNG SCIENTIST Award” was given to Bharatwaj of SBOA School, Annanagar, and Chennai for the model Nuclear waste disposal. Smart City model by Dhanush Kanna and Vaideeswaran of Nathella Vidhyodaya, Ambattur won the first place and a cash award of Rs.6,000 was given. Traffic Signal modulation based on Robotics techniques by S.D.Aditya Sai and N.Niteesh of TI MHSS, Ambattur, Chennai won the second prize, with a cash award of Rs.4,000 and Third prize was won by Daniel F and Shyam Sundar D of Vathsalaya MHSS,Kolathur,Chennai for Automatic Rest Room with a cash award of Rs.3,000.